We encourage organizations to use the Carrotmob approach however we no longer have the resources to assist with Carrotmob campaigns. You can keep us in the loop about your plans by emailing info@carrotmob.org. If your organization has a social good project that needs funding, see how The Spring can help. 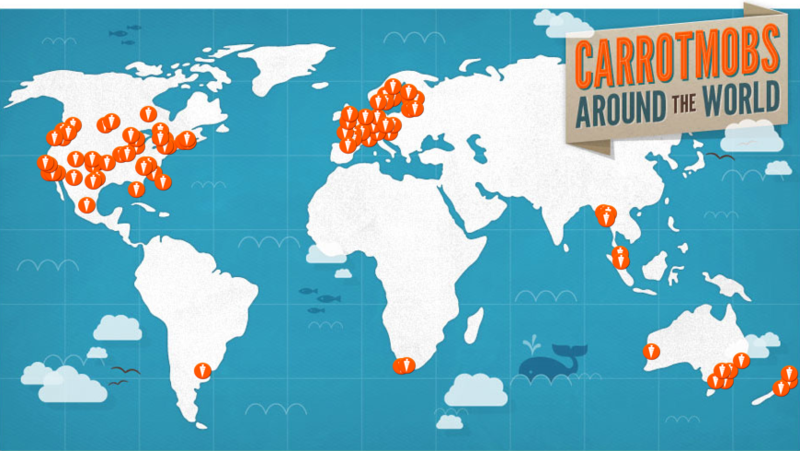 Use Carrotmob as a tool to engage supporters and businesses to advance your cause. The Carrotmob model is used to improve sustainability at businesses on a variety of issues such as Fair Trade, local food sourcing, and water conservation. Organizations and businesses work together to create change. Organizations make an impact and businesses get increased sales. It’s win-win. Carrotmobs make a tangible impact every time, unlike petitions or protests. 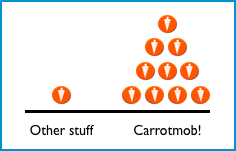 Carrotmobs are easy to participate in, fun, positive, business friendly, and more appealing than clicktivism. 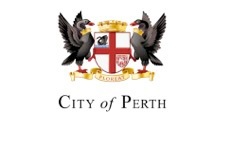 We translate your mission into a language businesses respond to. More than 100,000 Carrotmobbers have spent over $1M improving sustainability at businesses around the world with over 250 campaigns in more than 20 countries. Organizers have led 200 Carrotmobs to increase energy efficiency at businesses. Every single one of them has been successful at fighting climate change. Net Impact in New York saw more than a 10x increase in attendance at their Carrotmob campaigns in comparison to their regular events. 83% of Americans want the products they buy to benefit causes. More than a third of people who have participated in Carrotmobs don’t consider themselves activists and have never participated in an advocacy campaign before but they like Carrotmob’s broad mainstream appeal. Michelle Kitson from Community Environmental Council in Santa Barbara says they run Carrotmob campaigns because it’s a tangible and affordable way for supporters to contribute to the clean energy movement. CEC promotes solar energy and electric cars, but Carrotmobs are a way for anyone to get involved, with only a few dollars. Businesses respond when you drive sales and create marketing value for them. It’s hard to get the attention of businesses with petitions or protests if it doesn't affect the bottom line. To learn more about collaborating with Carrotmob, contact Nisha Gulati at orgs@carrotmob.org.